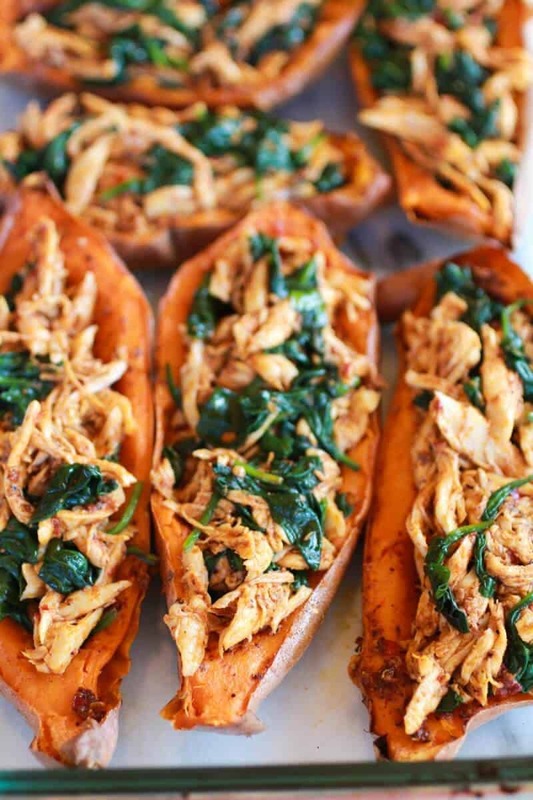 You guys are going to love these HEALTHY chipotle chicken sweet potato skins, but first, I have a serious question for you guys. Come on don’t tell me it is just me. I try to keep my computer clean, like really clean. I cherish the desk it sits on. Really, I LOVE my computer. It’s how I communicate with you guys, it’s how I watch TV, how I read (blogs, at least), how I develop recipe ideas and get inspiration, how I edit photos. I could go on an on, really I could, but my guess is you do not care. With all the back and forth of being knee-deep in Brownie Batter to needing to check the computer to see how much flour I need, my computer gets a little (ok, a lot) of love from the ingredients. What can I say, my computer knows what tastes good (except of course any liquid. I keep those far, far, far away!). Did I really just write a whole hundred and seventy words about my computer being covered in food? Ok, wow I am losing it. Sorry, it’s just that I’ve been thinking about my computer a lot lately because I think it may be on it’s way out and the idea of having to replace it terrifies me. File transfers, picture transfers, adapting to a new computer – I don’t have time for all that! But the idea of it suddenly dying on me terrifies me more. We are at least an hour and a half from the closest Apple store. Computer paranoia! Ok, stopping now. I made Sweet Potato Skins. They were legendary. Sweet, spicy and cheesy. Kind of an unexpected hit of flavors, but they are amazingly awesome together! Oh yeah, and like totally healthy. I know, score! They’re comfort food, done the healthy way, which of course still includes CHEESE! What is dinner without cheese? You gotta have some cheese! I mean really, sweet potatoes, chipotle chicken and sharp cheddar cheese. What is there not to love about that? 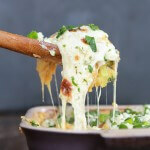 Melted cheese – Yes! Melted down computer – please no! You would never want your computer to die without a backup. You can order from Apple.com and I think shipping is free. Not positive but I believe it is. Everything we own is from Apple. I am so amazed at your cooking skills and your love for it at such a young age. Go girl!!!! Thank you! And I have my computer backed up on a hard drive and it’s an apple so it works great! We LOVE apple around here! Why can’t I come up with such awesome recipes? 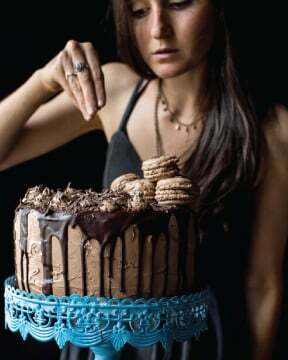 I’m making this TOMORROW…and I don’t even have to go to the supermarket! Thanks hon! Back in the day, when I first learned about computers, the first rule was ‘No Food Allowed.’ The second rule was ‘No Beverages Allowed.’ I guess that was what is listened to most. To this day, my computer doesn’t get to eat or drink my food. …except once when a grandkid managed to sneak a glass of water in and the promptly spilled it on the keyboard (yes, I had to get a new keyboard). But, sometimes things like those Sweet Potato Skins are awfully tempting to carry along to nibble on while I check email, etc. My computer is relatively clean. It is a desk top computer and resides safely across the house from the kitchen. My iPad, on the other hand, is covered in flour and fingerprints of mysterious substances 🙂 These potato skins look fantastic! Thanks for a delicious recipe. These look SO GOOD! I will be making these sometime soon. Tieghan, these look superb! And I have sweet potatoes in my pantry right now… I think I know what’s for dinner tonight. P.S. Clicked here from the Simply Sweet Home Friday Favorites hop. 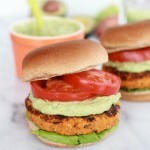 These look awesome – I love sweet potato so this looks so delish! 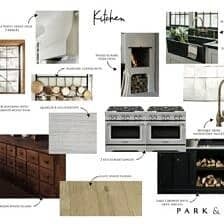 I know what you mean about your computer by the way – when I use it for recipes it gets much love from the ingredients as well! OH my heavens this looks soooooo good! I’m like drooling over here!! Haha pinning this now! 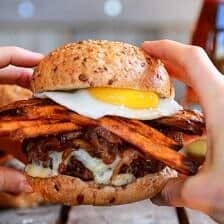 Just wanted to thank you for posting your recipe on Foodie Friends Friday Linky Party and linking the recipe back to us! I have selected your recipe as my host favorite this week. Your recipe is featured today on my blog, http://adornedwell.blogspot.com/2013/02/foodie-friends-friday-linky-party-33_25.html as well as on Foodie Friends Friday Daily Dish (http://www.foodiefriendsfridaydailydish.com/recipes-that-caught-our-attention-6/). We will also be sharing on Facebook, Twitter and Pinterest. Congratulations! you are not alone! I have that same problem. Also I want to come eat at your house! Way better food than what I serve! Thanks for linking up at Show Me Your Plaid Monday’s! 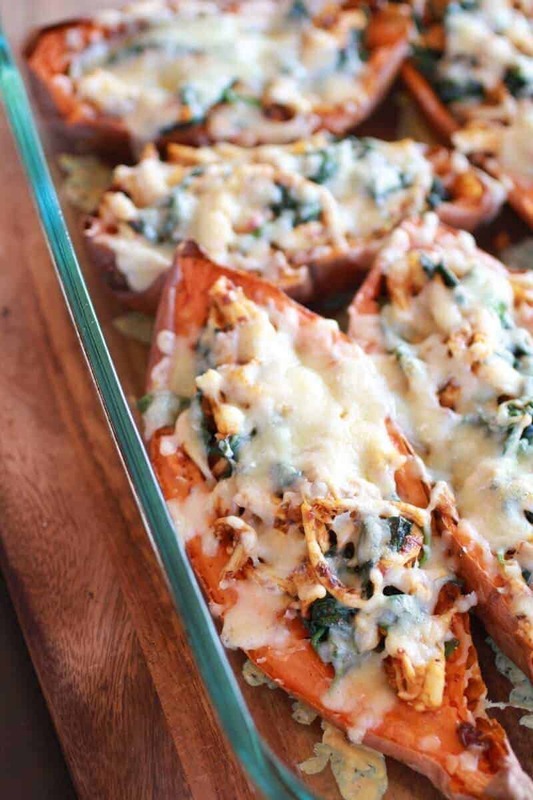 These look great.. My family loves sweet potatoes and I’m always looking for new things to do with them. We make baked stuffed potatoes all the time, but I never do it with the sweets.. thanks for the idea! These look great. 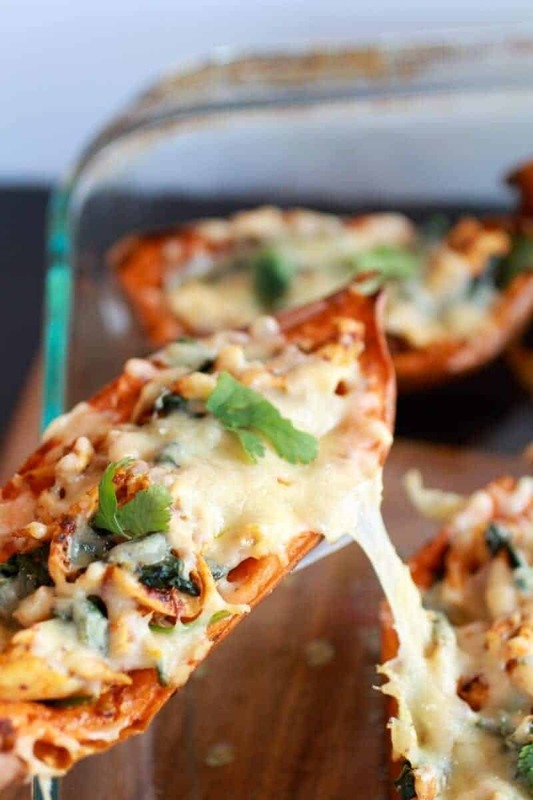 My very big question is —- I was always told that you should not eat sweet potato skins …. I think I missed something ???? I have never heard this. 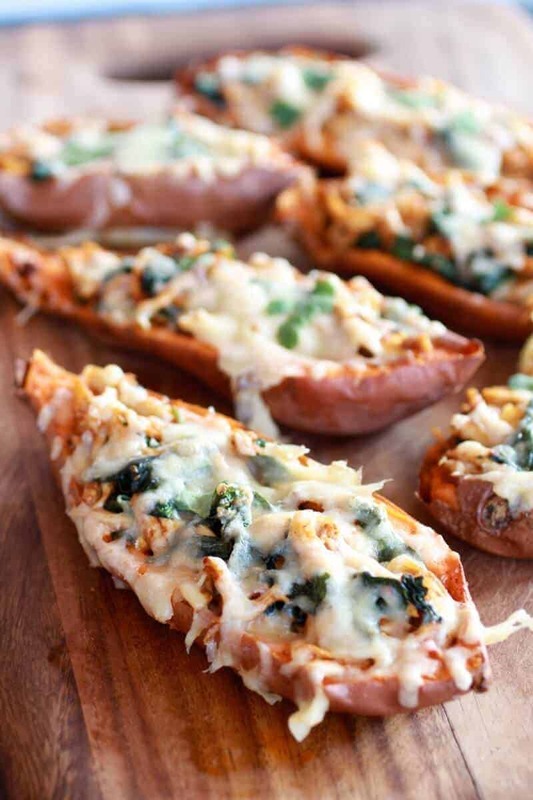 I am pretty sure sweet potato skins are very healthy and delicious. Enjoy! 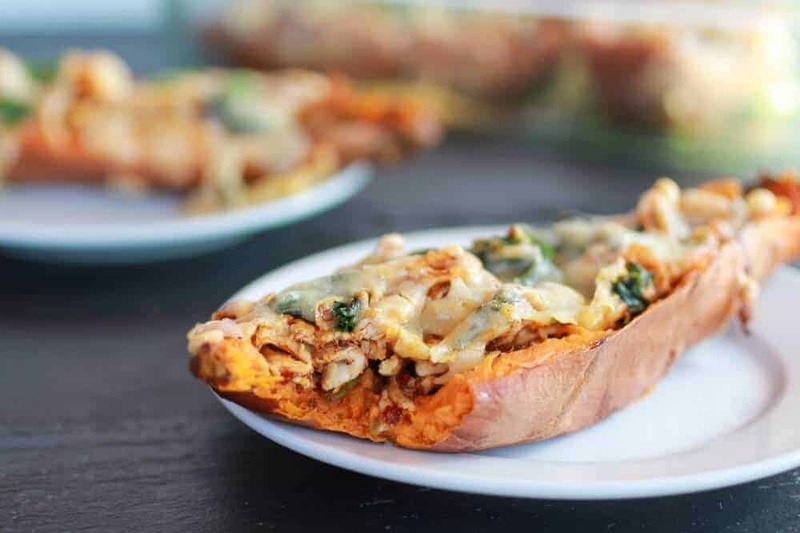 I love sweet potatoes and this one is loaded! Great idea. Was wondering if anyone has a calorie count on these??? They sound very VERY good and I want to make them soon. I used 1 pound of chicken thighs (instead of breasts) and 4 ounces of white cheddar (instead of 5). I also used 4 smaller, long sweet potatoes so it would make 4 servings (my nutrition info reflects using three sweet potatoes, which I figured was a good estimate since you scoop a lot of the flesh out). I cut the chipotle to one and about a tablespoon of adobo sauce. VERY filling and I like those macro ratios a lot. This will be a regular in our house. Hey, those are some good stats! Thanks for posting them and I am so glade you loved these! Haha I love how you wrote more about your computer than the actual theme of this post! It was quite amusing. And I didn’t waste my time since I got what I wanted in the end. Thanks for the recipe! I will try it out as soon as possible. Made these tonight and LOVED them! Thanks for the recipe! Unusual, but so delicious. I love how you have made this healthier by using a sweet potato. Just pinned! This looks delish, something my family would like. Our party is live today, and we would like to invite you to link up and share this: http://thebusybhive.blogspot.com/ We would really appreciate it. 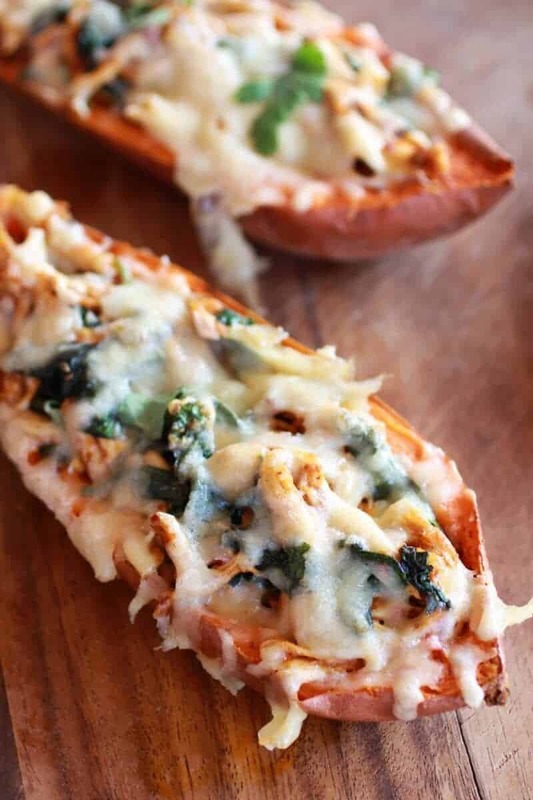 As for calories, I calculated 339 for a whole sweet potato with 1.5 cups of shredded chicken, 1/2 cup of spinach, garlic, jalapeño (no chipotle on hand), and 2% mozzarella on top…no garnish. Delishhhhh!!! I am so glad you liked it!! And wow these are pretty low cal! Awesome! Just wanted to let you know that I made these for dinner tonight and WOW!!! I think these are by far, one of the best things I’ve ever made for dinner. SOO GOOD!!! My husband, four year old son, and I loved them. I’m already craving them…too bad my hungry husband ate what I had intended to be my lunch for tomorrow! These will become a dinner regular around here for sure! The flavors are just amazing. YAY! I am so glad you guys loved them!! I love comments like this! Made my night!! I made these tonight and they were delicious! I cut back on the chipotle just a bit, but the spice and the sweet of the potato was the perfect compliment. YES! I am so glad you liked these! Thanks for letting me know! I am SO glad you like these!! I love all the tweaks you made to to! YUM! I can’t even explain in words how delicious I thought this was. I totally overstuffed myself because I simply could not stop eating these! They were HOT, but adding some plain greek yogurt and guacamole helped cool things down. The added flavor of the sweet potato was out of this world. YUM! YES! i am so happy you loved these. Thank you so much for letting me know! I need to make these again! 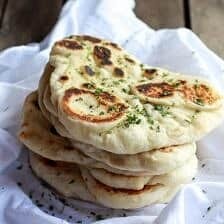 I made these tonight for dinner and they were amazing! Great recipe. Well thank you!! I loving hearing from readers and I am so glad you loved these!! I just loved these! They were so delicious and healthy. I used chipotle powder in place of the peppers because that’s what I had on hand. I used about 1/2 tsp. Thanks for the great recipe! I am so glad you love these! What a smart swap using the chipotle powder! Thanks so much for giving these a try and letting me no you loved them! 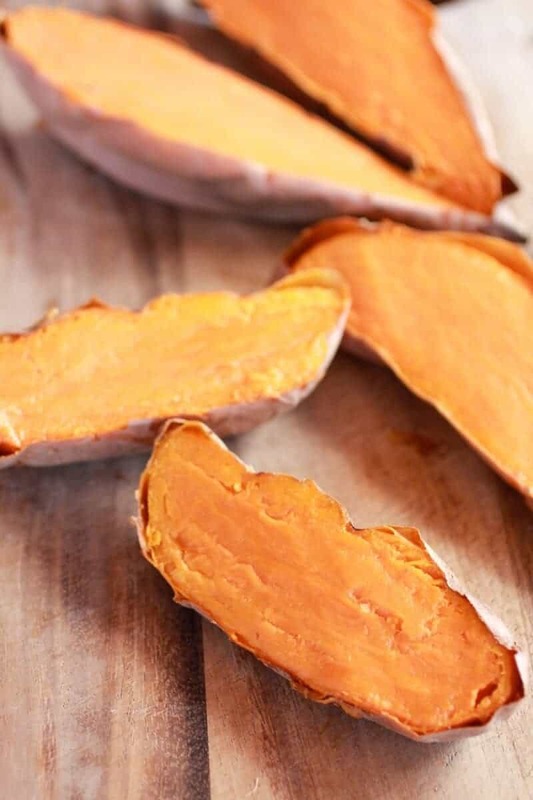 Thanks for sharing this sweet potato recipe on my FB page ~ it looks great! Suns shinning bright here in Frisco, hope you are having the same weather in Telluride! Just made these and they are so delicious. Turned the left over sweet potato into a puree with butter, brown sugar and cinnamon. Thanks for the recipe! YES!! I am so happy to hear this Lizzy! Thank you for letting me know and that puree sound incredible! YUM! These look delicious and will be making them this week!! Are you using dried chipotle peppers?? Can’t wait to taste them-Thanks! Thank you, Ashley! I used chipotle peppers in adobo. Are u sure these are healthy? I just literally made these and healthy has never tasted this good! I am utterly surprised and will def try it again…ps I improvised a bit I used kale for the filling and served over a bed of spinach!!! Superb! Yup, I am sure!! So happy you love them and I love kale! That sounds awesome! 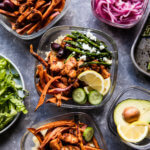 This healthy recipe looks like a winner! Great for any occasion and so easy to make. Thank you for sharing this delicious recipe! 1. I never post on people’s recipes. 2. My husband is a pretty good cook, but VERY picky. 3. Said picky husband did NOT want to like this! Now, for the main idea, WOW, the WHOLE family loved this!!! The one year old and the adults got seconds (and thirds)! The bird-like three-year-old ate her portion and agreed that sweet potatoes were AWESOME. My husband said, “This is the most flavorful thing you’ve ever cooked!” People looking at the comments should realize, THERE IS A REASON THERE ARE NO BAD REVIEWS. This is tasty, and it’s going to go into our regular rotation — or at least into our entertaining foods rotation! 🙂 Thanks for sharing! YA!!! So happy I got your picky eaters to eat and your picky husband to love this!! So happy you guys loved these! I never comment on recipes. But this one I had to. These. Are. Amazing!! So healthy, filling, comforting, easy, just perfect. The flavors are spot on. They blend together so well. I’m struggling to find words that will tell people how good these are–please just make them!! One more comment…..my husband took one bite and said “I had the worst day at work today. Thank you for making this….it’s making my night a whole lot better!”. Then as soon as he finished he went to his computer and added these to his spreadsheet of dinners that he likes (yes, he’s an engineer and keeps things very organized LOL). He even gives recipes a rating and he gave these a 10. FYI…a 10 means that he loves them so much that he will eat them every day. Holy moly!! This is awesome!! I love this! Thanks so much, Kim!! I am so glad both of you guys love these! Oh yeah!! Thanks so much for the nice comment Kim!! I am so happy you love them! Thanks Again! Everyone in my family loves a side of rice, but I actually just served these as a main with no sides. It worked great, but rice, bread or roasted veffies would be another yummy option! Hope you guys love these! These. Are. Amazing. Its a bit involved – baking the potatoes, baking the chicken, shredding the chicken, shredded the cheese, cooking the spinach, etc etc – but it was so worth it! They were DIVINE. Also – I only used two chicken breast but they were pretty large and I ended up with so much extra chicken mixture at the end. So I just combined it with the filling I carved out of the sweet potatoes, threw it into a pie plate, and topped with more cheese and baked for a few minutes. Its delicious and I am bringing it to lunch tomorrow! PS, I like it spicy so I added more chipotle peppers – if you do this, add a little honey, it really compliments the spicy. YUM! I love extra spice and totally agree with the honey. Sounds awesome! So happy you loved these!! Thanks for giving them a try! Hello! I’ve been clicking around your site for 20 minutes and I can’t figure out where the written recipe is for these sweet potatoes! I’ve clicked on every picture and link and can’t find it! Please help! Hi Diane, I am not sure what you are talking about. I am seeing the recipe just fine? Are you saying you cannot see it within the post? This recipe is the BOMB. top 10 favorites ever. I recommend using canned chipotle peppers. They come in this amazing sauce that really brings the recipe together. GOOD FREAKING JOB!!! Haha! Yes! Thank so much, Beth! I actually always use the canned chipotle chiles and the adobo sauce too!! So good! SO happy you loved them!! Thanks Anna! I made these tonight, and they were literally one of the best things I have ever had in my life. 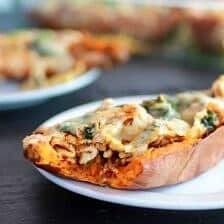 This recipe contains some of my favorite things (sweet potatoes, cheese, cumin), so I expected to like these, but my goodness, amazing, truly amazing, and easy. Oh, and I half cooked the sweet potatoes in the microwave for 7 minutes first to speed things along, worked out perfectly. YAY!! SO happy you loved these!! I am loving this idea but I’m not really into chipotle. I am not so good at cooking with spices (I’m more of a baker). Do you have a different spice idea that would still go well with all of the other ingredients? I think you could probably just leave the chipotle out and these will still be great. No need to add anything in its place. Hope you love these! Yup- we just left out the chipotle all together. The kid doesn’t like spicy 😉 But even without, hubby said it was one of the best things he ever ate- and he used to be a cook! I made these recently for my family, and they (and I) LOVED them! I think next time I will try them with black beans instead of chicken for a delicious meatless meal. SO happy you guys loved these!! Thanks Carissa! Black beans would be awesome! I absolutely loved this recipe! I will definitely make this time and time again. Thank you! Thanks Megan!! So happy you loved this! I started to make this, but didn’t have a use for the rest of the sweet potato, so instead of making it into skins, I put all of the baked sweet potato in a casserole dish, and then layered it the same as your recipe called for, baked again to melt the cheese, and then served it in a tortilla to take a little edge off the spice. DELICIOUS! i would have never put this flavor combination together on my own. Thanks for the recipe!!! This is SO GOOD! I made it last night and ended up eating some of the leftovers for breakfast. It’s a new favorite. My boyfriend doesn’t like sweet potatoes so it might be a challenge to get him to try it, but I think if (when) he does try it, he’ll love it! Or at least like it. But I love it! I strive to reach your level of food photography! Thanks for the great recipe and I am so happy to share it with my friends through my blog. Thanks so much, Jennifer! It looks awesome! These are SO good! I ended up mixing in a can of black beans as well and it was a-ma-zing! I also added the sweet potato flesh back into the mixture and added a little extra adobo sauce to keep the spiciness up. One of my absolute favorite dinners now! Thank you so much! So excited you love these. Thanks! I found myself without sweet potatoes, and discovered that the chicken/spinach mixture topped with the cheddar is also amazing on a tortilla. I packed two for my DH to take to work and he took the time to text me and say “You can make those taco things anytime! They were crazy good!” 🙂 The kids liked them too. Alas, no leftovers. So happy you love this and yeah, I bet the chicken is great wrapped up as a taco!! These were super good! I made a few small changes as I didn’t have all the ingredients. I didn’t use any cumin and I used mozzarella cheese instead of cheddar. But I think even if I hadn’t made any changes these still would have been awesome! I am so happy you loved these and could adjust them to your needs. TAHNK YOU! Going to try this recipe tonight. Any suggestions for the scooped out sweet potato? With the scooped out sweet potato I make black bean and sweet potato taquitos or shepherd’s pie. I just mix the sweet potato back in to the stuffing mixture, actually. I also add a can of rinsed black beans to it, and it’s super tasty! Might want to mix in a little bit of the adobo sauce to keep the spiciness up. I would mash it with just some butter + cinnamon or use it on a baked good. This looks amazing! One question about the chipotle sauce. Do you chop the peppers on the first step? The instructions simply read “add the peppers”. I’m hoping to make this tonight so I can’t wait to hear back! We love this recipe, and it has become a regular on our menu. I suppose you could do it different ways, but we always finely mince the peppers before adding to the other ingredients. Thank you! So happy you are loving it!! Hey Eric!! I AM SO SORRY!!! Yes, chop the peppers. Hope you love this and again, sorry I did not get back to you yesterday. Followed your recipe last night for dinner and OMG delish!! The chipotle sauce was amazing. Great Recipe!! Made this recipe tonight for my family and it was a HUGE hit! Delicious flavors – you are a master chef! What recipe do you use for the rest of the sweet potato? Thanks! I just like to mash it with a little butter, brown sugar, salt and pepper. Thanks! 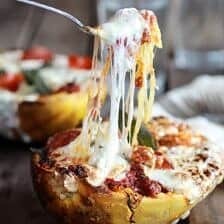 question: this is marked Paleo friendly but there is cheese and sour cream in the recipe? No dairy in Paleo do u have a version without? Hi, just replace the cream with coconut milk and leave the cheese out. Hop you love this! I used frozen Swiss chard instead of spinach and heated in a skillet until liquid was absorbed. Added shredded rotesserie chicken and heated through.added 1/2 can chopped green chilies instead of chipotle peppers . I used avocado oil instead of olive oil and organic garlic powder. My husband never eats sweet potatoes ,this recipe he said to me needs a name so he can ask for it again!!!! Sounds very good. I am going to make this but cut way back on all the oil and use just a bit of reduced fat cheese. My friend and I made these tonight and they were SO GOOD. Definitely going to make them again in the future! Made this the other night and it was incredible. I used the packaged rotisserie chicken breast from Costco ( left over chicken breast that doesn’t get sold that day, amazingly easy). I love spicy and the amount of chipotle was perfect. I just had one of them for lunch today and it was just as tasty. Great recipe. Will definitely make this again. This looks amazing. I’m planning on making it next week on Sunday for my lunches that week. Will this be good for 5 days? Thanks so much! Oh I think that is such a good idea!! The sweet potatoes should be fine for 5 days. Hope you love them! I love this recipe. I made it twice so far, the last time for my book club and they loved it too. The flavors are great. I love chipotle and added double the amount. I also used the Costco rotisserie chicken they package in a sealed bag. (I believe they pull the breast meat off of the leftover cooked chicken and sell it for $11/pk.) This made the prep much easier. I plan to make this on a regular rotation. Thanks!!! So happy these are huge hit! THNAKS!! Made these today for our annual AZ State/Univ of AZ football game and they were outstanding! The sauce is unbelievable! They will be my go-to appetizer from now on! YEAH!! So happy you loved these! Thanks! Would you happen to have the nutrition information? Hey Tiffany, I am sorry I do not. HI! Yes, chipotle paste will be great. I would add to taste, but my guess is around 2-3 teaspoons. Let me know if you have other questions. Thanks! Could you microwave the sweet potatoes to cut down the cooking time? I am sure that would work great! Let me know if you have other questions, thanks! That sounds awesome Mary! I am so so happy this was perfect for you! Thanks! What do you do with the extra sweet potato that you scoop out? I don’t want to waste it. Hi! I used it for other meals like a grain bowl, served as a side dish or use in baking recipes. Hope that helps! Do you use fresh chipotle peppers or canned? Anyone know how many total calories this meal has? Hi Leanne! I find it easiest to use an online calculator when looking for the calorie content, then to divid by the servings! I just cooked this for Christmas lunch to feed 6 adults, it was an absolute hit (may have cooked it 3 years ago for Christmas lunch as well)! Bring in the southern hemisphere it suits so well eating something nice and light during hot weather. Very filling, plates may as well have been licked clean. Used one more chicken breast than specified, everyone got half a sweet potato each. I am so glad this was a hit for your Christmas lunch! Thank you Feona, Happy Holidays! 😮 I just made these!! And can I say I don’t like sweet potatoes, but these were sssoooooooo good! I was not only amazed but also impressed! These will definitely become a regular in our house!!! Thank you for posting. Wow thank you!! I am so glad you enjoyed these! This recipie is amazing! The sweet potatoes are excellent to taste and are healthy! Definitely make this if you haven’t already! The key to this is really the chipotle peppers. Any suggestions for flavoring the chicken if chipotle seasoning hates my stomach? 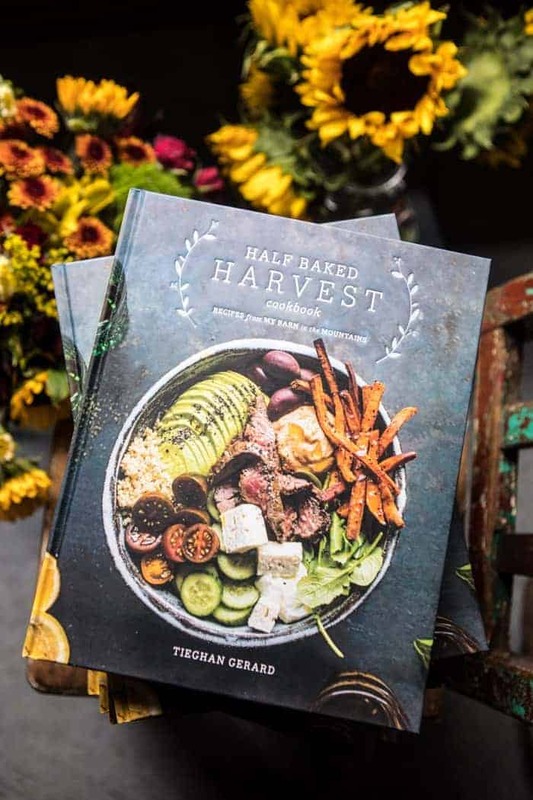 I made another of your recipes last night and ordered the cookbook immediately after eating it! You inspire me. I’m heading to the kitchen to try this out. The picture looks so delicious that I can event wait to cook it. I’ll keep you posted what’ll happen. anyone tried to freeze this? This is the second time I have made this recipe and it is so delicious! The chipotle that I find easily is in adobo sauce, so its a little spicer than intended, I think. But it is definitely a winner, especially for my spicy-food-eating Mexican husband. Perfect! I am so glad this turned out well for both you and your husband, Sarah! Thank you! I have been making this recipe as a family favorite for the past 5 years. 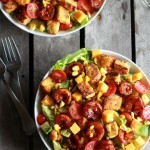 SO amazing and flavorful- and even fill up my husband with some for leftover lunches. This recipe introduced me to your blog and truly I have grown so much as a cook thanks to you! Thank you so much Liz! I am so glad you have been enjoying my blog and I hope you continue to! I just found these and they are DELICIOUS! This will be added to our regular rotation for sure! That is so awesome to hear! I am so glad you loved this recipe, Jessie! Thank you! Essas peles de batata doce ficam com um sabor surreal, fiz nessa semana e adorei. Muito gostoso, muito grata por ter compartilhado conosco. When you baked the potatoes the first time around, did you wrap them in foil first or just toss them in on their own? Do you eat the skin as well?? This looks amazing!! I can’t wait to try jt! !